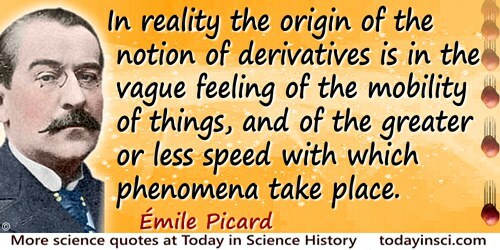 In reality the origin of the notion of derivatives is in the vague feeling of the mobility of things, and of the greater or less speed with which phenomena take place; this is well expressed by the terms fluent and fluxion, which were used by Newton and which we may believe were borrowed from the ancient mathematician Heraclitus. From address to the section of Algebra and Analysis, International Congress of Arts and Sciences, St. Louis (22 Sep 1904), 'On the Development of Mathematical Analysis and its Relation to Certain Other Sciences,' as translated by M.W. Haskell in Bulletin of the American Mathematical Society (May 1905), 11, 407.